Part I of "Dominica In 'Inter-Schools' Basketball" presented a brief note on the origins of the Windward Islands Schools Games (WISG), and Dominica's performance in Boys' Basketball for part of the 1987-2015 period. Team Dominica Boys has placed at all four positions in WISG Basketball. One of the occasions when Dominica Boys placed 2nd was 1999, when the Nature Island hosted that edition of the Games. That year Brian Mason was Dominica's and the Tournament's Highest Aggregate-Scorer, amassing 80 points (or 42.11%) of Dominica's aggregate-score of 190 Pts. He was also adjudged Dominica's MVP in basketball. Grenada had defeated the home team to grab the basketball segment of the championship. Dominica Boys also placed 2nd in Grenada in 2014, in 2016, and may possibly have placed 2nd (or 1st) in 1998 when the boys from Sisserou Land won 2 of their 3 matches, losing only to St. Lucia 64-66. In 2013, Dominica Boys settled for 3rd Place, with a "1 & 2" Win-Loss record. The team had similar results in 2017. Unfortunately, the Boys team from the Island of Many Rivers sat in the cellar position in WISG Basketball on a couple of occasions. In 1997, for example, we came 3rd among the three participating teams. Likewise, in 2000, due to similar win-loss records of the three teams after the winner, Dominica had to settle for 4th place on account of the Laws of the Game. No Games were held from 1994 to 1996. Dominica's overall performance in basketball at the 2018 Games will be presented in some detail below. Dominica Girls in WISG Basketball: The year 2010 was a very important one for the Windward Islands School Games when, for the first time, competitions were held in five disciplines – including basketball – for both boys and girls. 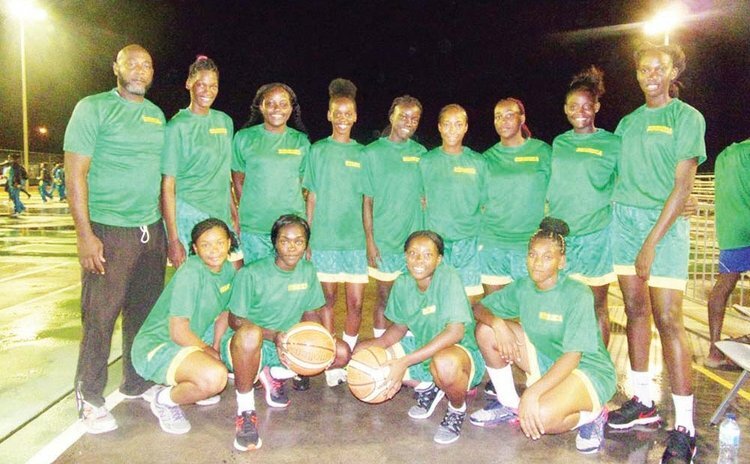 Since the introduction of Girls Basketball in the WISG the Sisserou Girls have placed 2nd on several occasions, including 2011 and 2015 when Dominica hosted the Games. Dominica Girls had defeated St. Vincent & the Grenadines 39-20 at WISG 2011. In 2015, Dominica Girls defeated St. Vincent who 'threw in the towel' at the end of the 2nd Quarter with the scores at 31-09. They also defeated St. Lucia 76-46, but lost to Grenada (eventual champions) 31-50. The Sisserou Girls also placed 2nd in 2016 and 2017, then improved their standing in 2018. Dominica's Basketball Teams' Overall Performances in WISG 2018: Dominica's representative basketball teams at the 2018 Windward Islands Schools Games, which were hosted by St. Lucia, emerged with mixed results. The Nature Island Girls won the 2018 WISG Girls Basketball championship with an impressive unbeaten run, mauling Grenada and St. Vincent 43-14 and 45-11 respectively. They then thrashed St. Lucia 38-22 to put the icing on the cake. That was our ladies' first championship in the nine editions of the Games since Girls Basketball was introduced eight years ago. Dominica Girls amassed 126 points and conceded only 47, for a goal average of 2.681 in their three matches. Goal average is obtained by dividing total points scored by points conceded in a game or a competition. Dominica's Kayla Winston (featured in Jump Ball's "Basketball in the Family") has played with Dominica Girls annually from 2013. Dominica Boys, on the other hand, were less fortunate, placing 3rd in the basketball segment of this year's Games with a 1 & 2 Win-Loss records. Our Boys ended with an aggregate-score of 110 pts, conceded 184, and had a goal average of only 0.598. The Boys only victory was against St. Lucia (their first opponent) 47-40, in a low-scoring affair. In Game 2, the Nature Island Boys lost to Grenada by 4 points, with a score of 55-59. In Dominica Boys' final encounter, they were defeated by St. Vincent & The Grenadines in Over-time, 78-85, after scores were tied 70-70 at the end of Regulation Time. The loss to St. Vincent was described as "disappointing", on the Sports Division's Facebook Page. Since WISG Basketball bounced off 31 years ago, Dominica Boys have stood at the top of the Awards podium on several occasions, e.g. 1987, 1988, 1989, 1990, 1993, 2002, 2011, 2015. Our Boys also took the runner-up position in at least 1999, 2014 and 2016. Dominica Girls emerged 2nd on several occasions since Females Basketball was introduced in 2010. Our ladies eventually took top honours in 2018, and CONGRATULATIONS are certainly in order on this achievement. The Sports Division, Dominica's contingent for WISG 2019, and all Dominicans by extension, will certainly be looking forward to Dominica Girls doing a "repeat" in basketball next year, and for Dominica Boys to return to the top of the podium. The Nature Isle will be hosting WISG 2019. Victorious Dominica Girls Basketball Team at 2018 Windward Islands Schools Games.